Now I wasn’t coming into this blind; I’ve recently completed DS3 & BB. Success is based on skill. 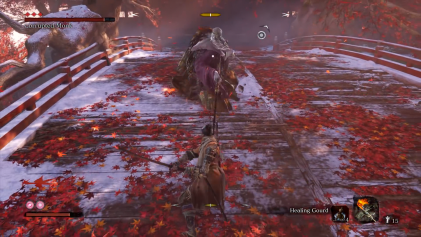 This may seem like a flippant statement, but in prior FromSoftware titles if one was having issues with an area or boss, you could grind out experience and level up, maybe update weapons, and even recruit another player to help you finish off an opponent that was destroying you time after time… in Sekiro you cannot. I’m enjoying how their is no narrative to hold your hand, exploring and accidental missteps open up routes once thought locked. The grapple hook adds a vertical element to the levels, and allows for quick movement. Aggression pays. While it’s always good to block, dodge, and counter, getting in hits while you can is paramount to victory, certainly over the mini-bosses, and there seems to be plenty of them. These bosses take on a variety of shapes and sizes, while still fitting into the Shinobi Japan theme.